"Writing your name can lead to writing sentences. And the next thing you'll be doing is writing paragraphs, and then books. And then you'll be in as much trouble as I am." 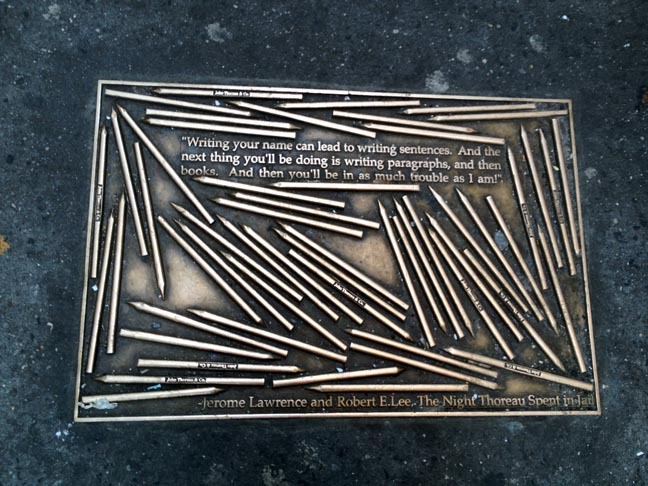 So speaks the titular character in Robert Edwin Lee and Jerome Lawrence's The Night Thoreau Spent in Jail. The two-act play debuted at their alma mater during the height of the Viet Nam War in 1969 and was one of the most popular college productions of the time appearing on campuses coast-to-coast. The play is based on the events that led to the arrest of Henry David Thoreau and a night spent in the Concord jail. Thoreau's crime — or act of civil disobedience? He had refused to pay a poll tax on the grounds that the money could fund the Mexican-American War, a war which Thoreau was against. The Night Thoreau Spent in Jail is in the same vein of many of Lawrence and Lee's plays in that they draw on historical events to address the issues of the day. In all, Robert Edwin Lee and Jerome Lawrence collaborated on 39 original works over their illustrious partnership including another play that draws on history and current events — Inherit the Wind. Whether it be a birth day, anniversary or publication date of a seminal work, the Bar None Group will revisit these 40+ quotations from time to time — quotations that inspire one to write, read, explore and embrace literature. We last visited poet William Carlos Williams.